“Wow.” That’s the only way I could describe NARS Cream Blush in Gold Member when I first saw the mega-wattage highlighter. There was no way I could wear this without looking like fool’s gold, or even worse, simply a fool. The intensity of the yellow was too intimidating for me, so I went looking for help. At a NARS makeup counter recently, I was shown just how wearable (and versatile!) Gold Member can be. The makeup artist introduced 4 fabulous ways to work with the creamy formula –- and I loved them all! Check them out after the jump. 1) Bring attention to your best features! Using your middle finger, lightly blend the highlighter in a large semi-circle outside each eye. Start at the end of the brow and sweep down and over the tops of cheekbones. Hello, bright eyes! Next, dab a light line down the middle of the nose. This will draw attention to the middle of the face. 2) Emphasize cheekbones! Using a brush (yes, you can use a brush even with creamy formulas! ), sweep Gold Member over your regular blush for a flushed glow. 3) Use as an overall illuminator! Rub a good amount of the golden stuff on the back of one hand. Add a drop of foundation. Blend together and use all over face. The result is a gorgeous dewy look! Stephanie recommends this trick to tone down heavy, smoky eyes. A matte face with dramatic makeup looks too severe -- a tiny bit of shimmer all over the face will actually pull together the look. Who knew? 4) Plump up those lips! Dab over your favorite lipstick. The verdict? 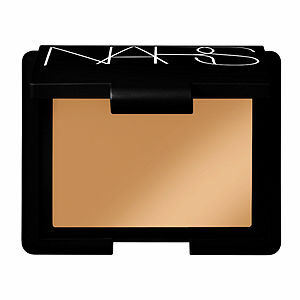 Not only is NARS Gold Member fun and totally wearable, it actually brings out your best features! Love! NARS Gold Member retails for $28 at beauty.com. LOVE this blush from NARS, and yes, VERY wearable, not to mention versatile. Great post--discovered even more ways to use it!! Sometimes I wish they would advertise these things not just as blush but as a blush accessory. I thought all of those ideas were fantastic but I might not have thought of them on my own!